You will have heard murmurings that getting into University was going to get tougher. Good thing too. But I must admit I thought to myself, they will probably tinker with the entry requirements at the margins. I was vaguely interested because they affect my son this year. He isn't the most academically inclined and I am in no position to criticise him because he gets it (or in this case, doesn't get it) from me. We are both very focussed, to the point of obsession, in those matters that interest us. If they don't it's a struggle to concentrate. For him it is music. And we are all supporting in him his attempts to build a career around it. Next year he continues his piano studies and music production. But he had planned to do two papers at the Victoria School of Music. Yesterday he found out that, despite having passed the music school's requirement - sat a theory test - he missed the overall entry requirement for Victoria University by 5 points and is now wait-listed for the papers if a place becomes available. The university raised the requirement from 120 points in 2011 (I am told) to 150 in 2012. Good for them. Son will have to redo one of his NCEA papers and re-apply. Fortunately he is young for his year. Many other 17 year-olds are only starting year 13 next month. Somewhat surprisingly he's more relieved than disappointed. I hadn't realised he was dreading a major fail - a miss by a mile. And that his parents would, in his words, "go ballistic". We didn't. We talked about it, the options and we move on. Both of my children are musical and their performances, when they are in the zone, move me immensely. Robert's practising of Bach, Rachmaninov and Chopin fills the house and I couldn't be happier. At 17 he is extremely self-aware. Is utterly determined to make his life count for something. To make it matter. How could I be disappointed with that? The NZ Herald reports today that "Benefit fraud cost taxpayers a record $22.6 million last year..." and that it is up from $15.9 million in 2009/10. They got this information under The Official Information Act. The Herald fails to define what sort of fraud it is referring to. Perhaps it is that fraud which is prosecuted. Types of benefit fraud comprise working, living in the nature of marriage, child out of care, multiple benefits, accommodation, false documents and other. Anyway, if they had wanted to be sensationalist, the current flavour, they could have almost doubled their headline figure. In 2009/2010, marriage-type relationship cases accounted for 39% of overpayment cases but 57% of overpayment dollars. Elaborate rip-offs make for lurid reading but most of the fraud is committed by parents pretending they live alone when in fact they do not. The Scotsman (or the Crown Office) has taken the unusual step of publishing photos of the home environment in which a 15 month-old baby boy died. I am reproducing them because I recognise them (generically) from my time volunteering. I once described a home I worked in as presenting an archaeological challenge. You start with the first layer of detritus and work your way down, meeting ever worsening degrees of rot. Fortunately I have a strong stomach, probably because my curiosity and urge to 'put right' overrides my constitution. If it is any comfort, the children who live in them know nothing else. One of the appalling images of filth and decay, which were released by the Crown Office, shows the cot where Declan’s body was found. 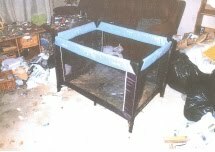 It is surrounded by so much rubbish – clothes, plastic bags and toys strewn across the floor – that the carpet is no longer visible. 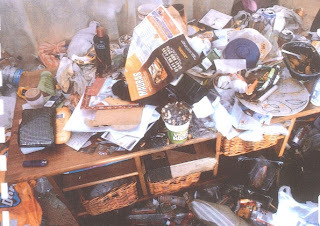 In another room, Declan’s playpen or travel cot – where Hainey had claimed she found his dead body – looks like a rubbish dump, filled with empty bottles of 3 Hammers, a strong white cider, Irn-Bru, old newspapers and crisp packets. At the extremes, and not withstanding other complicating factors, this is what you get when you give people money every week and expect nothing in return. She says because families might receive a benefit of about $750 a week people assume poverty isn't real. "The problem is the mismanagement of those funds. "We watch people try to cope on the benefit and it doesn't work," she says. It has to be a political socio-economic issue and maybe the high number of solo parent families at the school is another contributing factor. At the 2006 Census one parent families with dependent children in Waitara numbered 29 percent. Below the national average of 30 percent. You want high, look at places like Porirua East with 41 percent, Tokomaru Bay with 40 percent and Otara 38 percent. I don't know what is happening with the population of Waitara though. It was static between 2001 and 2006 and the 2011 census didn't go ahead. But between 2006 and now the number of people on the DPB has risen by 39 percent to 429. "Nanny state in danger of being replaced by the bully state"
I have touched earlier this week on the series that the Taranki Daily News has been running on child poverty. Someone (thank you) sent me this link to today's paper. The article describes how beneficiary parents are turning up at budgeting advice simply to get the tick they need to stay eligible for their benefit. You can take a horse to water etc. But while I was looking at that I also noticed this editorial by Gordon Brown (ironic name) which really hits the nail on the head. What a chord Saturday's stories about Waitara Central school principal Sharren Read struck. It was all about the "poverty" that exists among those who go to her school and how she and other committed staff members deal with it. She told it pretty much as it is, which was refreshing in itself, but what a desperately sad story it was as she drew a picture of what was going on. "Kids come to school simply to be fed. With help from Fonterra and Sanitarium for two days a week, which means the school fundraises to pay for the rest, children are given a free breakfast every morning. Lunch is also available to the neediest ones. "Some probably slept for a few hours amid the noise of partying, boozing and drugs. "They fight for a space to curl up on the mattress they are sharing with four siblings, sharing one urine-soiled blanket. They might get to school on a Monday because a teacher picked them up. Mum was still drunk from the Sunday night binge session." There was more, much more sordid detail, but that's enough to go on with. You get the picture. Ms Read and other like-minded colleagues do their best to make a difference and they should be congratulated for what they do. Some of Ms Read's quotes are worth further examination. "We have one child that often won't be at school on a Monday and we're now aware it's because mum is coming down from the weekend and needs the kid to be home to help out," she said. It was revealed, which will be startling to many, that some families receive a benefit of about $750 a week. "The problem is the mismanagement of those funds." Let's start with that first quote. Mum (no mention of a dad, of course) is presumably coming down from partying during the weekend. Booze, drugs and who knows what else is cited as part of the lifestyle. Therefore, the child has to stay home from school to "help out". That is a form of child abuse, nothing less. I wonder when mum was last prosecuted under the truancy laws. Anyone disagree with the answer: never? On to the second, and perhaps most revealing, quote in the article. Ms Read courageously points the finger exactly where it belongs, at those self-indulgent, greedy parents who shamelessly squander money on themselves, rather than their children. It amounts to theft. Taxpayers gave that money to them to look after the children. As always, it is important to point out that not every recipient of government benefits does that. Some do a fine job under difficult circumstances and work hard to better themselves. The accurate, but unpalatable, message from Ms Read that some parents not only contribute to the "poverty" the children exist in, but are also the main reason for it, will have the apologists and do- gooders scrambling to attack the very notion that the noble oppressed classes could actually be the problem. But Ms Read and deputy principal Emma Burleigh are the heroes in this debate, so rather than attack them and risk the wrath of right-minded people, no doubt those who know best will abuse columnists such as myself for merely having the temerity to agree with the sentiments expressed. As usual there will be personal observations, insults and much claiming of some self-created moral high ground from which their missives will be fired. The only thing missing will be facts and a willingness to debate the specific issues. Often the outraged letter writers will have a vested interest in prolonging the "poverty" state, but invariably that is never mentioned. The nanny state is in danger of being replaced by the bully state, where those who don't toe the party line that everything is the state's fault and beneficiaries are victims, quickly become targeted with just one aim - to shut the dissenting voice down. One thing Ms Read said does require a rebuttal is "that shops that allow families with little to take on debt through hire- purchase are making the problem worse". It is not the shops' fault, it is the people who buy the big television sets when they can't afford them that are the problem. It is the same as the shoplifters and their apologists blaming retailers for displaying their goods in such an attractive manner that theft was inevitable. Wrong. For every action, there is a consequence and every one of us makes our decisions and are accountable for them. Simple as that. I see Trevor Mallard is now getting it in the neck from The Standard over his allusion to UK Labour taking up the welfare reform cause. The welfare system isn’t broken – unless you count the 40% of 65 and 66 year olds who are getting a pension while being employed. The point of the welfare system is to do what any civilised society ought to do: provide some basic support to those who are unable to work due to sickness or injury and to those who want to work but find none is available. It does that at a cost of $5 per day each. The system works because when there are jobs to be had people go off the dole and into work. Employment growth under Labour dramatically reduced the number on the dole to just 17,000. Long-term unemployment recipients numbered a couple of thousand. The numbers on other benefits only rose in line with population and demographics. Overall, Labour got 100,000 people off benefits. Now, its gone up 60,000 under National. Why? Not because anything’s changed about benefits. Because there’s no fucken jobs. The problem with these observations is the assumption that the high number of people on other benefits when Labour took over was OK. It wasn't. The phenomenal rise in dependency - DPB and SB and IB - occurred during the 1980s and 1990s. That has to be reversed. Here's a painting from earlier last year. It is a composite. That is, made up from three different photographs. News out of Britain is Boris Johnson has attacked Conservative plans to reform disability payments. This blog links to media coverage about how the Mayor of London made a critical submission on a forthcoming reform bill which was only uncovered under the Freedom of Information Act. Naturally some very vulnerable people are afraid of what 'cuts' may mean for them and they have my sympathy. But what can governments do about the disproportionate rise of the numbers of people on incapacity benefits? Simply let the dependency rate continue to rise? It's a phenomenon that has occurred across many developed countries. 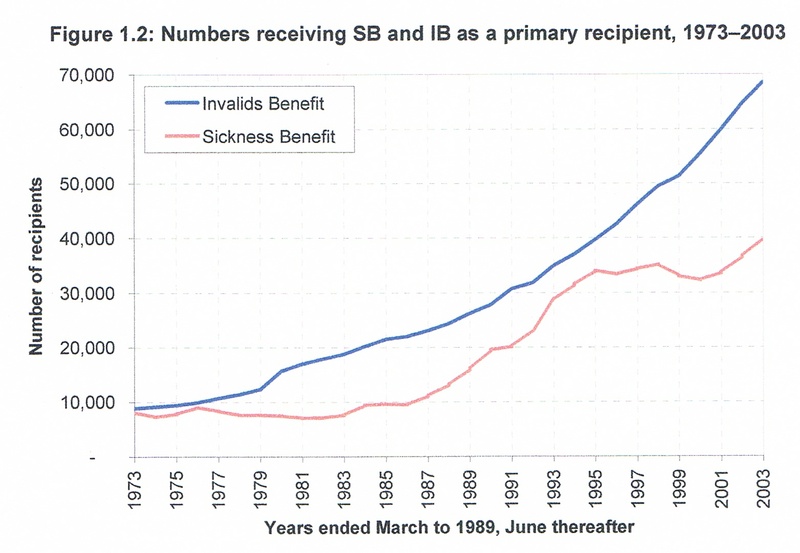 The following graphs depict NZ's growth in Invalid and Sickness benefits from 1973 to the present. Unfortunately the first is absolute numbers whereas the second two are as a percentage of the working age population. Our findings answer many important questions about the growth in IB and SB and the people who receive these benefits. We find no simple, single explanation for the growth that occurred over the decade to 2002 in numbers receiving IB and SB. The dynamics of growth were different for the two benefits, and varied over time and between subgroups. Growth in inflows has been an important driver of growth for both benefits. While much of the growth in inflows was inevitable given changes in the size and structure of the population and the increase in the age of eligibility for NZS, more than half cannot be explained by these factors and reflects an increase in the proportion of the population aged 15–59 coming on to the benefits. For SB, most of this growth was due to an increase in entries from outside the benefit system (but when we examine the recent growth between 1999 and 2002, increased transfers from within the benefit system account for 28% of the increase). 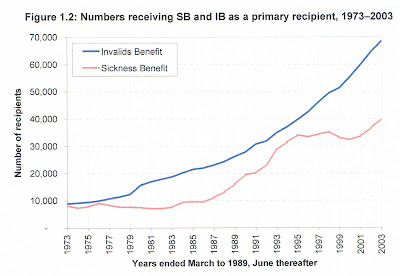 For IB, entries from outside the benefit system and transfers from inside the benefit system both contributed to the growth. Growth in transfers accounted for 60% of the 1993–2002 increase in the proportion of the population aged 15–59 coming on to that benefit. The long stays of IB entrants converted sustained growth in inflows into rapid growth in numbers in receipt. Even though the duration of stays on IB did not increase between the beginning and the end of the decade, duration played a key role in generating the growth that occurred. Why did SB and IB inflows grow in the context of a general improvement in economic conditions? Some of the possible explanations relate to changes in policy and administration, which appear to have shifted people with incapacities on to IB and SB from other parts of the benefit system. Other possible explanations relate to changes in the structure and intensity of employment which may have caused employment opportunities for people with ill-health and disabilities to worsen in spite of the improvement in overall employment conditions. Analysis of the New Zealand Disability Survey suggests that the presence of a disability reduces an individual’s probability of full-time employment to less than half that for a non-disabled individual with similar demographic characteristics, and that employment disadvantage is particularly notable for those experiencing psychological or psychiatric disabilities (Jensen et al 2005). Yet another set of possible explanations relate to changes in the way that qualifying incapacities were interpreted or administered. Determining whether an individual is sufficiently incapacitated to qualify for IB or SB is not straightforward (Lennan 2000). The eligibility criteria are subject to interpretation and a range of factors other than medical eligibility may influence the decisions of assessing doctors (White 2000). Given this, changes in the way in which doctors interpreted the medical criteria for entry could have increased the proportion of the population viewed as having qualifying incapacities. A final set of possible explanations relate to changes in the prevalence of incapacity. Growing numbers of people were coming on to SB and IB with a mental illness. The increase is consistent with trends in other developed countries. Comparisons of the prevalence of mental illnesses over time are difficult to make but rates may have been rising. Possible contributors include an increasing prevalence of stressors such as financial hardship and social isolation. New Zealand drug surveys also indicate a significant increase in the use of amphetamine and methamphetamine between 1998 and 2001. This can lead to a range of psychological disorders, including deep depression and symptoms that may be indistinguishable from schizophrenia, as well as physical disorders such as stroke and respiratory problems (EACD 2002). We observe patterns of growth that are consistent with the likely effects of the current rise in the prevalence of diabetes. The associated growth in obesity may also be contributing to the growth in numbers of people coming on to SB and IB with musculoskeletal conditions. Some of the growth in IB and SB might be due to the effects on health of long-term unemployment. Growth in IB inflow rates was more rapid for those aged 30–39 and 40–49 than for those aged 15–19 and 20–29. There is something different about the cohorts that experienced the economic restructuring of the 1980s and early 1990s in their early to middle years compared to those that entered the labour market either during or after the restructuring. Our findings show disparities in mortality across ethnic subgroups that are consistent with those found in the New Zealand Census Mortality Study (Ajwani et al 2003). This study found that while life expectancy improved dramatically for Europeans over the two decades to 1999 it was static for Māori and Pacific peoples, the ethnic groups most affected by economic restructuring. The main driver of the divergent trends was higher chronic disease mortality in middle and older ages for Māori and Pacific peoples. The 1998 National Heath Committee report on the determinants of health in New Zealand suggested that, despite an overall improvement in population health status, socio-economic inequalities in health had not decreased over the preceding two decades and may even have been increasing (National Advisory Committee on Health and Disability 1998). SB and IB trends over the decade to 2002 may partly reflect worsening health status for some groups in New Zealand society.